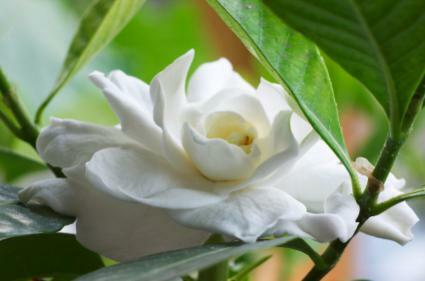 Gardenia lovers may want to purchase a beautiful gardenia bonsai for the home, but be warned; they're not the easiest plants to keep healthy and flowering. Like most bonsai, gardenia bonsai require attention and care. If kept healthy, however, they can be an exquisite and fragrant flowering bonsai for the home. Bonsai are plants trimmed to remain small and sculpted to forms imagined by the gardener. Many different types of plants can be grown as a bonsai. They aren't necessarily dwarf plants either, but are specially trimmed, shaped and cared for to remain small. Bonsai originated in China many centuries ago, and the concept rapidly spread throughout the Asian world. It's a popular art form in Japanese and other Asian cultures. As the name suggests, a gardenia bonsai is a gardenia plant that is trained and grown along wires to create interesting and intricate shapes. While you can grow them outdoors in gardening zones 7 through 9, you may also want to consider them houseplants that get a summer 'vacation' once the weather warms up. This way your gardenia won't be exposed to sudden extremes of temperature or freezing temperatures which can harm or kill it. Like other gardenias, gardenia bonsai require partial shade to bright, filtered light. Avoid direct sunshine; it is too strong for the gardenia. Morning light followed by afternoon shade is ideal.You can also grow gardenias under plant lights inside the house if your windows don't provide enough or the right type of light. Gardenia require evenly moist soil. Try not to let your gardenia dry out, but water frequently. The soil should be moist but not soggy. Gardenia need light feeding every two to three weeks from the spring through the fall. Discontinue fertilizer application during the winter to allow the plant time to rest. A good fertilizer for acid loving plants, such as Miracid, is recommended, but dilute it to about half strength for a bonsai. Don't fertilize your gardenia while it's in bloom, either. When in doubt, wait to fertilize the plant. Gardenia bonsai are grown along wires to train and shape the plant. You can purchase bonsai wire at garden center or through bonsai supply websites. Each soft, new shoot is tied to the wires or snipped off to help shape the plant. There's no right or wrong way to shape a bonsai. Use your imagination, and be gentle with the plant. Never prune or wire the stems when the plant has buds or flowers, but wait until it's dormant. Moving stems around while they have flowers or buds can cause the plant to drop them and leave you without your hard-won blossoms, the best part of growing gardenia! After about two years, the plant may need repoting. Look for bon, the special flat trays used for bonsai propagation, in major garden centers. The name "bonsai" actually means "tray grown" or "tray cultivated" and the special rectangular dishes in which bonsai are cultivates are called bon. Gardenia bonsai generally need an acidic soil with a pH of 5.0 to 6.5. Choose soils for acid-loving plants to be on the safe side. 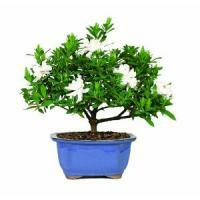 There are many sources of gardenia bonsai online. Amazon Brussels Bonsai: Amazon offers the Brussels Bonsai, a four year old bonsai standing about ten inches tall. Harry and David: This company is known for its gift baskets. The gardenia comes in a ceramic pot, and pot colors may vary from what's shown. 1-800Flowers: The company famous for its flower selection also offers a fine gardenia bonsai in a traditional bonsai pot suitable for gift giving.